It is so great to have the direct control of a bike. Fixed gear bikes only have a single speed and the pedals just keep moving whenever the bike is in motion. That means you have no time to rest - your legs will always have to keep on making perfectly circular movements. If you are getting tired the bike is saying "keep spinning". The bike motivates you to keep going fast. It is great training for getting better at cycling in general. You start riding differently. It is so much fun. If you never had this sensation then get on a fixed gear bike and try it out. The best thing is: you can do many tricks on fixed gear bikes. You can ride backwards, you can pull up the front wheel and do wheelies, you can track stand, you can skid, you can stand on the bike and surf it, you can ride sitting in reverse on it, you can do all kinds of tricks. It is just limited by your creativity. 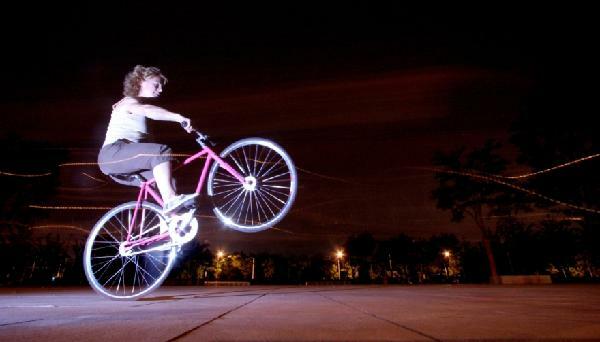 Go out and play around on your fixed gear bike and come up with new things.